If you're not sure you are a cider drinker, then the makers of this weeks cider want you to try theirs. In a clever marketing campaign they want it to be the dcider. I love the name and absolutely LOVE this cider. In a market which has been flooded by so many new entrants, many of which taste very similar - this one stands out for all the right reasons. 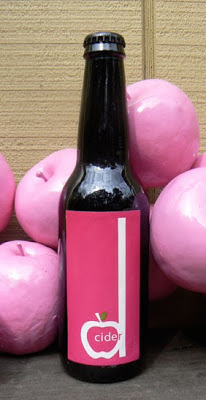 Dcider is made using 100% Batlow apples, with a combination of 50% pink lady and 50% blend which includes varieties such as Red Delicious, Gala and Galaxy. Produced by the winemakers of Eling Forest Wine Making Services in the Southern Highlands of NSW, you may remember I first introduced you to these guys when they produced The Apple Thief . Well, those guys have since moved on and Eling is now producing the dcider. A very light carbonation settles quickly revealing a crisp and delicious cider with lovely rounded sweetness, with just a hint of caramel. It is more of a complex, well structured cider and what sets it apart is the fact that it creates more creamy characters on the palate, more so than any cider I have tasted. It's so moreish and delicious that I quickly finished my first glass before I realised I was supposed to be analysing it. Whoops! When Pete first tried this one, he too was impressed and agreed it was very different to anything already on the market. Dcider is the perfect cider for pre or post dinner drinks and is great served with stronger flavoured foods or a cheese platter with a good stinky blue. At 4.5% alcohol, a 330ml bottle will provide you with 1.2 standard drinks. 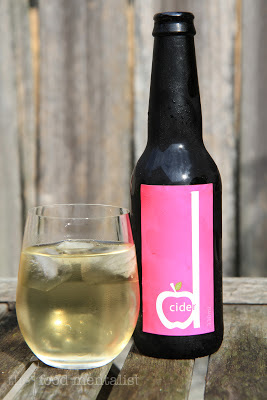 I can't wait to try Dcider! Do you know if there are any suppliers in Brisbane? Mmmmm hint of caramel.... I can taste it already!